When it comes to the bizarre and creepy nobody does it quite like David Cronenberg. As I have mentioned before this Canadian director is one of my favorites. 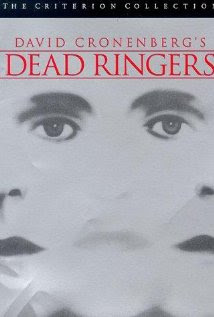 I have previously reviewed his other films “Rabid”, “The Fly”, and “Scanners.” This latest entry is for his 1988 drama “Dead Ringers.” This is the examination of the lives of identical twin gynecologists with a practice in Toronto, Canada. Elliot and Beverly Mantle (both male) operate a very successful practice and are models of professionalism. Jeremy Irons gives an absolutely incredible performance in playing both brothers. A new computerized technique allowed the filmmakers to seamlessly show both bothers in the same shot. Hooray for late 80’s computer technology! Elliot is the more confident and aggressive of the two. He is the public face of the twins and does all of their speeches and presentations. While Beverly is shyer and withdrawn, always busy with the research. The Mantle brothers, especially Elliot, are quite cold and clinical. They seem to operate as one person, with two distinct personalities. Can they ever establish their own identities even though they are identical? I’m sure this is a real-world problem that twins deal with every day. The brothers share an apartment, patients, and occasionally girlfriends. When Claire Niveau, an actress, visits their practice the brothers’ psychological time bomb ignites. They fool Claire into thinking there is only one of them, but she can sense the difference in their personalities. Without knowing it she prefers Beverly over Elliot and this starts a sort of bizarre love triangle. Claire is addicted to prescription drugs and Beverly soon follows close behind. When she finally finds out that she has been duped she is obviously angered and upset, but eventually keeps seeing Beverly. After this, the Mantle brother’s relationship begins to spiral out of control and descends into a drug-addled madness. Most all of Cronenberg’s films involve some sort of medical abnormality or anomaly. Like “Shivers”, “Rabid”, “The Fly”, and others, his earlier films were classified as horror and science fiction. 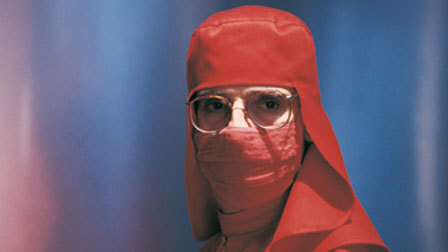 Dead Ringers, on the other hand, is pure drama, but still keeps his trademark eerie creepiness.